Pontevedra is a provincial capital of the Pontevreda province. 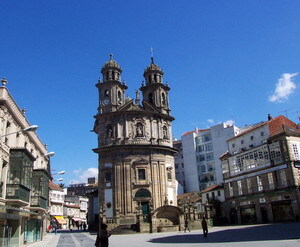 The province is composed of the city of Pontevedra and of fifteen rural parishes. Like much of the western coast of Galicia, Pontevedra has a temperate, rainy climate, but with peculiarities stemming from its location surrounded by mountains and the ría. Temperatures are pleasant for most of the year (mild winters and summers). 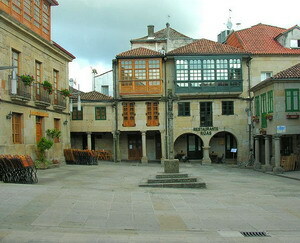 An ancient town and medieval port, Pontevedra has been described as a "definitive old gallego town". 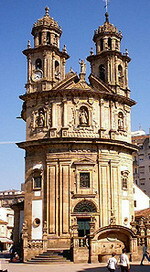 Sights include the pilgrim chapel in the Praza da Peregrina, the historic Zona Monumental (old city), the Praza de Leña, the market, and the Alameda, a promenade along the ría. One of Christopher Columbus' ships (the "Santa María") was built in Pontevedra. 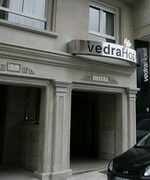 Located in the city centre and opened only recently, Hotel Vedra offers a first-class service far above its category and ideal for guests on business or pleasure. The special attention given by its staff and the care taken with every detail make up a new concept of accommodation in Pontevedra that is both exquisite and personal. Restaurant Braseria - The gastronomic offer is an experience for the senses, the decoration, with ultimate detail, gives a perfect equilibrium in distinctive spaces. The atmosphere that surrounds the client is perfect to enjoy an unforgettable evening. It has 34 cosy rooms with high-quality design and fittings. Warm, modern and quiet rooms with a wide selection of facilities, including WiFi Internet connection, 21" TV with Canal + and satellite and spacious wardrobes. The three-storey Husa Villa Covelo overlooks the sea on the border of Pontevedra, and is situated 1.5 kilometres from the picturesque fishing village of Combarro. Santiago de Compostela Airport is 84 kilometres away and can be reached in one hour by car. The Husa Villa Covelo hotel features an outdoor pool and a health club that includes a gym overlooking the fjord and mountains, a sauna and a solarium. Wireless Internet access is available in the hotel's public areas. Staff at the 24-hour front desk can look after valuables in the hotel safe. A buffet breakfast is served each morning in the Villa Covelo restaurant, which offers a choice of traditional Galician dishes for lunch and dinner. The 50 air-conditioned guestrooms are furnished in a simple style and offer sea views. 16th century renaissance palace - The Parador occupies a palace which was formerly the residence of the Counts of Maceda. In the historic centre of the city, it combines regal, noble lines with countless references to rural retreat in surroundings which invite one to explore the many coves and beaches. Distinguished, lordly and illustrious are three definitions of the interior, with a plethora of fine details, antiques and regal furnishings, and relaxing garden views. The carved stone staircase is noteworthy, leading to welcoming rooms and accentuating the aristocratic character of the Parador. Let us come into the restaurant, decorated with regal furniture, suited to the rest of the common areas. The menu is very varied, giving us the chance to taste the meats, fishes and shellfishes of the region, everything accompanied by the excellent Albariño, Ribeiro or Mencía wines. Pazo Larache was constructed in the 18th century and underwent several phases of extension at the beginning of the 19th century, it was finally reconstructed between 2002 and 2006 which gave rise to the present construction. In the access to the estate it is possible to enjoy the construction of a typical silo in Galicia (hórreo), furthermore there is the entrance area with its great historical and architectonic value. You can see a "lagar" of the 18th century in the access to the house. The property has a beautiful garden with an extension of fifty and five thousand square meters of land of great biological diversity with centennial trees that dominate the Ría of Vigo. All this will cause that you enjoy an pleasant and unique stay in Pazo Larache. Baiona - located southwest of Vigo lies the city of Baiona, a small but interesting place, especially in summer, when all the tourist facilities are fully offered to all visitors. 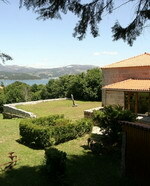 Some of the interest points of Baiona are its old beautiful buildings, sculptures, cultural places, etc. The Fortress is the most appreciable construction, walled and surrounded by the sea. Some of the more visible facilities are the sailing port and the Monte Real yacht club. Situated on the Monterreal peninsula, this is one of the most unique Paradors; the building is mid-way between a medieval fortress and seigniorial Gallegan architecture. It commands an impressive viewpoint above the ocean within a walled enclosure. It is protected by the sea and has a beautiful pine forest on either side. The hotel has magnificent, stylish rooms full of decorative features from different eras. Manorial rooms and spacious bedrooms, many boasting spectacular sea views, make up a grandiose interior along with its outstanding stone staircase in the entrance hall. Specialities and traditional dishes - Excellent Moaña Veal - You have to try the fantastic Gallegan cuisine offered by the Parador. Sea bass with razor clams in rapini sauce, shell fish dishes, tarta de Santiago (Galician almond tart), filloas (Galician pancakes), and Moaña veal. A total delight for the palate. Cambados - in the heart of Albariño wine country. This town offers a lot of possibilities of finding out about its past and its tradition. View the noble stately home of Figueroa, with several shields and original balconies in the tower, and the neo-classical church of San Bieito. 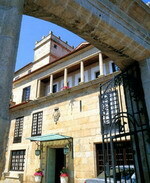 The former, Pazo de Bazán, was an ancestral mansion built in the 17th Century; it is located on the green landscapes of the Rías Baixas, on the Ría de Arousa. 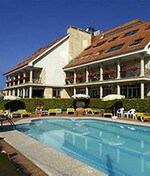 The Gallegan coast is dotted with leafy pine trees, beaches and numerous country houses. 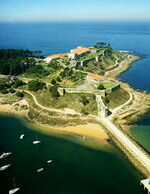 The Parador is in the centre of the small village of Cambados, only a short distance from the Isla de la Toxa. 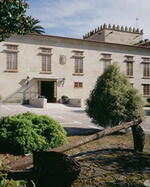 It has a pretty interior courtyard with and outstanding arcade and fountain, as well as a slender palm tree. It also has pleasant and light bedrooms with accommodating furniture. The other rooms feature stone columns, wooden ceilings and beams, as well as the gardens and an inviting swimming pool. There are many types of empanadas (breaded dishes). But none like the Gallegan variety. The best of all is the breaded cockles. You can also enjoy delicious seafood and fish dishes such as lenguado al Albariño (sole cooked in Albariño wine). With regards to the tourist industry within Spain, Northern Spain and in particular Galicia especially have been very much a hidden treasure and hidden within lies a further particular treasure called Pontevedra. Of all of the autonomous regions of Spain Galicia is considered the most remote and therein lies the charm of Pontevedra hidden away longing to be discovered. Galicia has always been seen as a poor rural region, whose economy was dependent upon agriculture and fishing and did not lend itself to modernisation and yet as far as tourism is concerned it is this constant contact with the past that gives the region its appeal and charm. The Galicians are fiercely proud of their culture and language and their Celtic heritage; it is what makes them unique (they feel) within modern day Spain. Galicia always seemed to be a very closed and inward looking area being fiercely resistant to any formal external invasion and in many ways this degree of isolation was very much driven by the geographical location of the region. In what has been a mountain to climb slowly but surely Galicia is now trying to manage successfully the twin track of its regional lifestyle with a much more modern society and thankfully this appears to have had very positive results with regards to tourism with little sign of negative effects..
A tour of Pontevedra is probably best started on what is called the Alameda Boulevard which has often been described as the green lungs of the town. One of the more established parts of the city the boulevard houses many lovely 19th century buildings that are now home to many important offices.